Maryland is the 13th US state, and is located in the Mid Atlantic Region, bordered by West Virginia, Virginia, the District of Columbia, Pennsylvania and Delaware. 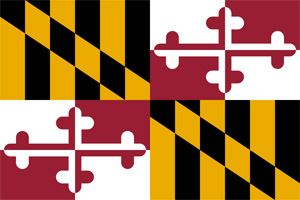 Maryland is also known as the Old Line State and the Free State. As of the latest census, Maryland has a total population of 5,633,597. According to the latest US Census, Maryland has the highest average household income among any other US state for three years straight. Maryland is a life science haven, having over 350 bio-technology firms, institutions and agencies. Maryland has the University System of Maryland, Howard Hughes Medical Institute, J Craig Venter Institute, National Institute of Standard and Technology, Food and Drug Administration, National Institute of Health, Celera Genomics and so much more. Maryland has a diverse array of typography, which is why it got its name, ‘America in Miniature. Maryland has sandy dunes, to low marshlands, to seagrass, to rolling hills, and mountains. Major industries in Maryland are food products, chemicals, transportation equipment, metals and computer & electronic products. Maryland has the Chesapeake Bay by the Eastern and Western Shore. The bay is full of oysters, crabs, clams and many marine species. Stone, sand, gravel, coal and cement are the main mineral products of Maryland. While in Maryland, be sure to see and visit its many tourist attractions such as: the Fort McHenry National Monument, Chesapeake Bay, Harpers Ferry, National Aquarium, US Naval Academy, USS Constellation, Jefferson Patterson Historical Park and Museum, Goddard Space Flight Center, Ocean City Beach Resort, Fort Frederick, Catoctin Mountain and the Maryland Science Center.